Gazebo kits, patio & DIY pergola roofing made from American shingles provide the perfect solution to build new roofs and replacement roofs alike. A gazebo is a roofed structure that provides a 360-degree view of the surrounding area. If your idea of enjoyment is breathing the fresh air and spending free time outside, then a covered outdoor living area should be high on your wish list. An outdoor living area is the perfect place to slow down time and relax. Permanent gazebos, a pergola with roof or covered patio all provide protection from Australia's harsh elements. Simply pull up your favorite chair and let nature take away the stresses of the day. Enclosed patios, permanent gazebo kits or pergola roof's can provide the perfect area for entertaining your guests. This outdoor living area will become a focal point for your gardens where you can soak up the view. As a result, our asphalt shingles are a fantastic option supplied as DIY pergola kits, patio roof kits or gazebo kits. When purchasing a new patio roof, DIY pergola kits or gazebo kits, an important consideration is the gazebo kits price. The size and material choice will influence the gazebo cost, patio or pergola price. Use the price chart below to explore our gazebos for sale. 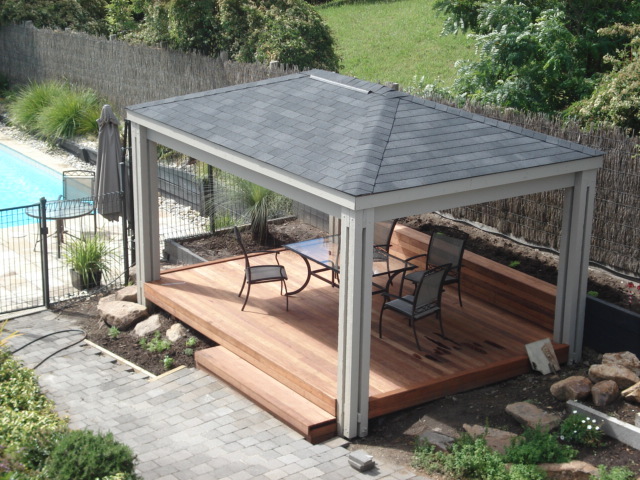 Check out our gazebo kit prices and compare to the other roof options. Our gazebo kits for sale are very cost effective with the longest warranties available. To obtain a more detailed gazebo cost, patio roof or pergola price use our Gazebo Kits Calculator. Within this calculator, you can include the roof overhang, change the pitch and adjust lots of other options for detailed pricing. Our American shingles are long-lasting materials made to resemble the natural beauty of Slate and Timber shingles/shakes. In contrast to Slate or Timber, shingles require absolutely no maintenance for a lifetime. As a result, shingles are extremely cost-effective, far cheaper than other roofing options. They are even up to a third of the price of other alternatives. Furthermore, shingles are fast and easy to install, and therefore a great do-it-yourself solution. Simply email the measurements of your outdoor gazebo, patio or DIY pergola roof. We will provide you with a quote for the materials required to complete the job. If you require help with the measurements one of our team will be happy to be of assistance. You can also use our handy Permanent Gazebo Roof Calculator. Simply enter the details of your permanent gazebo and it will work out how many bundles of shingles and synthetic underlay you require. We stock a full range of natural profiles and Colours which can be sent out quickly. The lightweight and compact nature of the product means we can send out orders across Australia. This includes Melbourne Victoria, Sydney NSW, Brisbane QLD, Adelaide SA, Perth WA, Tasmania TAS , and Northern Territory NT. A cheap gazebo roof option - Considerably cheaper than most outdoor gazebo alternatives. Can replace thatch, cedar shakes, tiles, metal and virtually any roof material. Very easy to build DIY kit installation. Long-lasting with 20 - 40 year International Warranties. Suitable for pitches above 9.5 degrees (lower achievable). Suitable as a wall cladding. Similarly, light outdoor gazebo, patio & DIY pergola kits are easy to send around Australia. Styles resembling natural slates and wooden shakes. Shade providing. Protection from Australia's hot damaging sun. Above all suitable for gazebos, pergolas, enclosed patios, sheds, garages / carports and Bali huts. To measure your outdoor gazebo, patio or DIY pergola roofing, here is a great program. Gazebo kits, patio and pergola roofing are the proud Australian distributors for IKO Corporation, the largest exporter of shingle materials worldwide. As a result, we have been in business for over 15 years, experts in the supply and installation of asphalt shingle materials. Due to this experience, we have supplied thousands of customers their roofing requirements. Custom permanent gazebo, patio and pergola kits supplied to build new or replacement roofs can be sent anywhere in Australia. For a relatively low cost, the lightweight form and compact shape of asphalt shingles enable us to send it to remote areas of Australia. As a result, these lightweight gazebo and pergola kits (18kg/m² including plywood) can replace virtually any type of cladding from metal to tiles and anything in-between. Do-it-yourself installation is becoming increasingly popular for new homes and above all, outdoor roofs of all types. Due to this, our custom kits can be used to build a shed, patio, gazebo or pergola roof, and could be the perfect weekend project. Long-lasting asphalt shingles are therefore the ideal replacement for aging pergola roofs, thinning Bali huts, enclosed patios and rotting outdoor gazebos. With absolutely no prior knowledge of installing shingles, customers are achieving brilliant results. Therefore, weekend DIY'ers can build these roofs with simple tools (hammer, nails, knife, and chalk-line). The reward is either a 30 year or Lifetime International Manufacturers Warranty. If you are still planning your new outdoor living area there is a great little program called Blocklayer - Gazebo kits, patio & pergola Calculator. Within this program, you can adjust the measurements of your new outdoor gazebo. First of all, choose a square four-sided roof or alternatively you can stretch it out to create a rectangular shape. Rectangular outdoor roofs can be the perfect place for long entertaining tables. Due to the easy customization of the plans, there is no need to be limited to a 3m x 3m gazebo or 4m x 4m etc. You can create the perfect size for your unique outdoor living area. For a European feel, you can add a couple of sides. Voila! a hexagon gazebo. In contrast, create an American gazebo showpiece, an octagon gazebo. Also an enclosed patio or pergola with roof can provide you with the perfect place to enjoy the Australian outdoors. Further to this, you can adjust the angle of the "roof pitch" from a low slope 10-degree to a steep 45-degree. Adjusting the length or a roof overhang is a simple process. However, be aware that low slope roofs can often have a longer overhang. Follow the instructions and be rewarded with a full and detailed set of plans. These plans provide the perfect starting point for you to build your custom made dream gazebo, covered patio or pergola with roof. Take these plans and purchase your permanent gazebo, pergola and patio materials required to build the frame. You can then send us the measurements of the roof and we will work out your kit requirements. Finally, you can choose to do-it-yourself build option saving money, or find a local Carpenter / Handyman to complete the job. Asking a local Carpenter to help you build our patio / pergola kits or shingle gazebo kits can be a little tricky. More than likely they will have no experience installing our outdoor roofing before. Not to worry, our installation guide shows step by step DIY instructions which are easy to follow. Due to this, you can achieve a quality installation with basic tools - hammer, knife, chalk-line etc... All of the steps are fully explained with pictures and videos. Finally, if you are still unsure of the installation process help is only a phone call away. Call one of our gazebo kits, patio or DIY pergola kits specialists for advice or to supply a free no obligation quote for your Gazebo Kits, Patio roof or DIY Pergola Kits project.